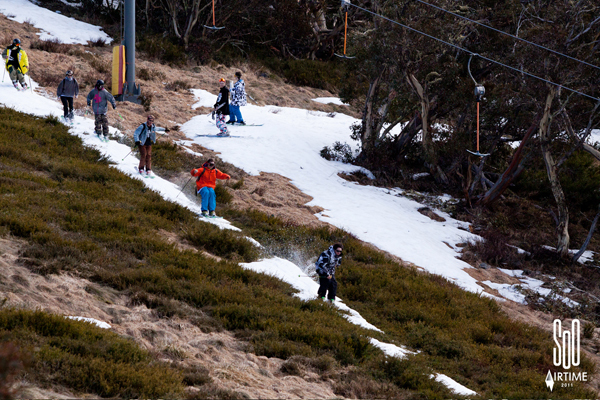 A few weeks ago 30 odd friends met at Mt Buller, Australia for five days of intense riding, shooting and a whole lot of other fun activities like dice, dancing and loopy conversations in front of a fire. There were two teams, Team NSW and Team VIC. They had one task, five days to shoot a short film whilst under the goodtime guidance of nature, who provided blues skies, green grass and a patch of snow – plenty to get excited about. It was a creative bowl of jelly that got so hot it never had a chance to set. After the week the teams parted and editing finally allowed everything to cool down. The films were then posted online for voting to decide the winner. After three weeks of social media hustling voting has now closed and one state stands a top Mt Victorious. There was SoO much excitement around this film given its unconventional subject and it proves one thing… SoO Airtime is more than just riding down mountains with a couple of cameras. Team NSW came out on top beating Team VIC by a tiny margin. But the real winner was snow inspired mountain sports and everyone who smiled with the happy man in leopard print underwear. If you’ve only just plugged into the SoO Airtime starship to infinity have a look at the films and get excited about the next time you’ll get to slide those slippery slopes.